The Board of Classic Minerals (ASX:CLZ) has developed a strategy that will see the company exploit its substantial gold assets in the Southern Forrestania Gold Belt. 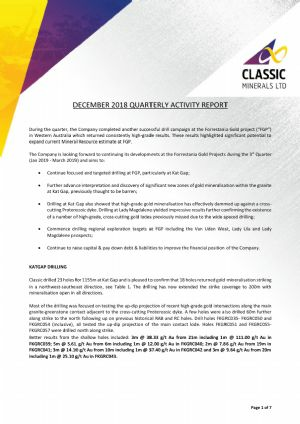 The directors of Classic Minerals Ltd (ASX:CLZ) submit herewith the financial report for the half-year ended 31 December 2018. During the quarter, Classic Minerals Ltd (ASX:CLZ) completed another successful drill campaign at the Forrestania Gold project in Western Australia which returned consistently high-grade results. These results highlighted significant potential to expand current Mineral Resource estimate at FGP. 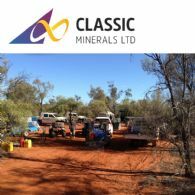 WA-focused gold exploration and development company Classic Minerals Limited (ASX:CLZ) is pleased to announce that it has exercised the Option and acquired a 100% interest in the Kat Gap Gold Project covering exploration licences E74/422 and E74/467; subsequent to meeting all the conditions precedent. WA-focused gold exploration and development company Classic Minerals Limited (ASX:CLZ) is pleased to announce that it has received assays results from its recent RC drilling program at its Forrestania Gold Project (FGP) in Western Australia. 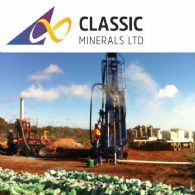 Classic Minerals Ltd (ASX:CLZ) provides the Short Form Prospectus. 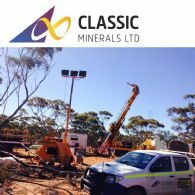 WA-focused gold exploration and development company Classic Minerals Limited (ASX:CLZ) ("Classic", or "the Company") is pleased to announce that it has commenced RC drilling at its Forrestania Gold Project (FGP) in Western Australia. During the quarter, Classic Minerals Ltd (ASX:CLZ) completed another very successful drill campaign at the Forrestania Gold Project in Western Australia returning consistently high-grade results. The results of this and previous campaigns, is providing increasing confidence for the Company to expand the current Mineral Resource estimate at FGP. 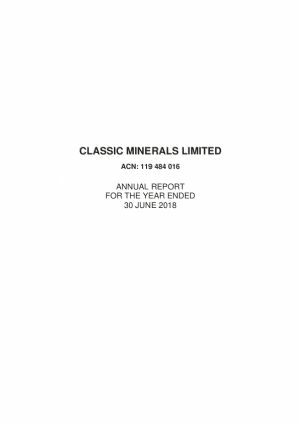 Classic Minerals Ltd (ASX:CLZ) provides the Company&apos;s Annual Report to shareholders. WA-focused gold exploration and development company Classic Minerals Limited (ASX:CLZ) is pleased to announce that it has successfully completed the first stage of the Two Tranche Placement to raise $1.0 million before costs. The raising received significant demand from new domestic shareholders and was managed by leading Perth and Sydney-based stock broking firms. During the quarter, Classic Minerals Ltd (ASX:CLZ) completed 2 orientated diamond drill holes at Lady Magdalene and advised the market of the Phase 2 RC drill results from the Forrestania Gold Project in Western Australia which returned high-grade results from outside the current Scoping study pit design. WA-focused gold exploration and development company Classic Minerals Limited (ASX:CLZ) is pleased to provide an update on its Fraser Range Ni-Cu project in WA. 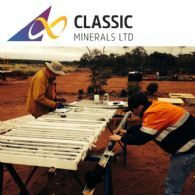 WA-focused gold exploration and development company Classic Minerals Limited (ASX:CLZ) is pleased to announce that it has been granted 1 tenement (E77/2472) and has won the ballot process for 2 tenement applications (E77/2470 and E77/2471) at its Forrestania Gold Project in Western Australia. 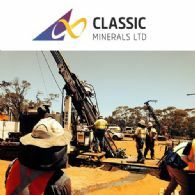 Classic Minerals (ASX:CLZ) advises that it has completed a Scoping Study based on the Inferred and Indicated Mineral Resource at its 80% owned Forrestania Gold Project, located approximately 120 km south of Southern Cross, WA and 17 km southwest of the historic Bounty Mine site (mined/current resources of +2.0M oz Au).